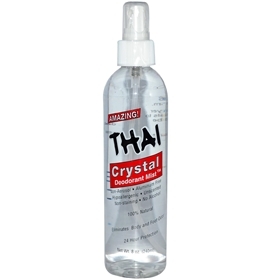 Thai Crystal Mist Pump Deodorant is a natural crystal deodorant in a convenient spray formula. It has an easy applicator non-aerosol pump and is the solution to eliminating Aluminum Chlorohydrates and other chemicals from personal hygiene products. In today's polluted world, the demand for better health and a cleaner environment has forced all of us to find effective and healthy alternatives. This safe, odorless, easy to use pump spray will keep you odor free without harsh chemicals, it contains just 2 simple non-toxic ingredients. Can also be used as an all over body spray, including as a foot spray to eliminate foot and shoe odors. Works very, very well, and travels well. This is the only natural deodorant that really works! I have tried Jason, Tom's, etc, but this is one that keeps me odor free for 2 days. I really recommend it. from Nashville We love this product! My family & I have been trying to get all harmful chemicals and toxic substances out of our lives. For women especially, since we shave our armpits, spraying chemicals into the lymphnodes is very bad. This product keeps my husband and I dry and odor free for 2 days. We love that we can share it, and it really works. Little changes like this make a difference.